Soft Skull Press, 9781593762896, 128pp. Deep Focus is a series of film books with a fresh approach. Take the smartest, liveliest writers in contemporary letters and let them loose on the most vital and popular corners of cinema history: midnight movies, the New Hollywood of the sixties and seventies, film noir, screwball comedies, international cult classics, and more. Passionate and idiosyncratic, each volume of Deep Focus is long-form criticism that's relentlessly provocative and entertaining. 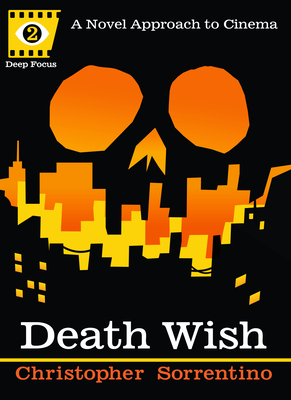 Christopher Sorrentino's examination of Death Wish is the second entry in the series. The fourth collaboration between director Michael Winner and actor Charles Bronson, Death Wish was the apotheosis of a succession of films hitting screens during the seventies--including Bullitt, Dirty Harry, and Walking Tall--that tacked against a prevailing liberal wind in Hollywood cinema. Exploiting audience fears of a bestial "other" infesting American cities, and explicitly linking law and order with a pastoral ideal of the Old West (and exurban subdivisions), its glib endorsement of vigilantism infuriated liberal critics even as it filled theaters with cheering audiences. Sorrentino examines Death Wish in its various contexts--as movie, as provocation, as social commentary, as political tautology, and as depiction of urban life--and considers its lasting influence on cinema.